Thanks to Dr. Sleiman Khal, Al-Assad Hospital (Syria) for contributing this case; Dr. Nicole K. Andeen, Oregon Health & Science University (USA) for writing the discussion; and Dr. Debra Zynger for reviewing it. To contribute a Case of the Week, first make sure that we are currently accepting cases, then follow the guidelines on our main Case of the Week page. (1) Pathologyoutlines.com set records in October for sessions per day, total sessions, users and page views. Sessions per day were 37,838, up 35% from October 2018. Total sessions were 1,172,992, users were 471,435 and page views were an incredible 2,654,280. 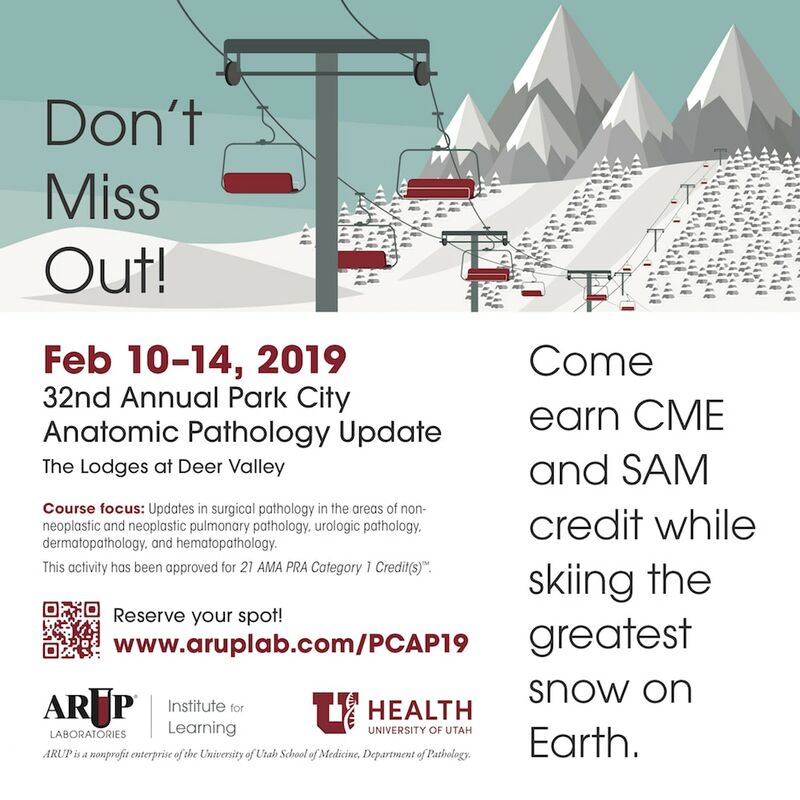 Thanks for making us your go-to source for pathology information; your support helps us continue to grow and to serve the worldwide pathology community. (2) We are inactivating books in our database from 2012 or prior years, with the exception of those from AFIP, ARP Press, ASCP, CAP or WHO. Let us know if there are older books that you want listed or newer books that are not on the Books pages. 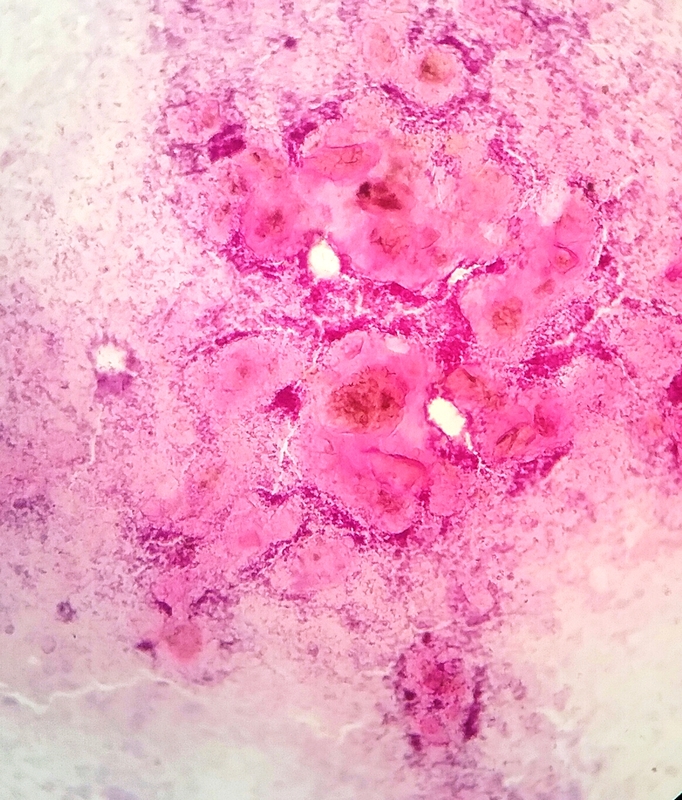 A 50 year old man from Syria with scrotal nodules was referred for an FNA to rule out tuberculosis. The patient also had vitiligo on his genitalia. Which of the following is true about scrotal calcinosis? Scrotal calcinosis occurs in the setting of pre-existing cysts (epidermoid or pilar) or by calcification of dermal connective tissue in the apparent absence of a detectable cyst precursor (idiopathic). Idiopathic scrotal calcinosis is a rare benign condition characterized by accumulation of multiple painless calcified nodules within the skin of the scrotum. Epidemiologically, the condition presents in boys and men in early adult life, commonly the third and fourth decades. An age range of 5-85 years has been reported (Arch Dermatol 1970;102:199). The nodules range from 0.1 cm to generally 3 cm (Arch Dermatol 1970;102:199) but may become large and distort the scrotum (Dermatol Surg 2002;28:745). Patients may be asymptomatic or have symptoms related to skin breakdown around the lesions with discharge and itchiness or scrotal heaviness (Am J Dermatopathol 2007;29:172). Notably, patients lack a significant family history, evidence of systemic calcification, hormonal or metabolic abnormalities (N Engl J Med 2013;369:965, Arch Dermatol 1970;102:199). 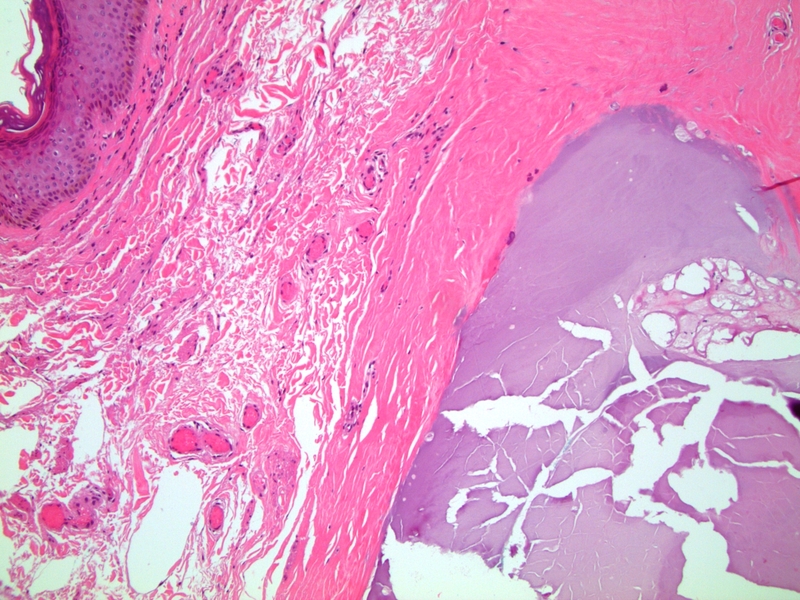 The proposed pathogenesis is dystrophic calcification of a pre-existing epithelial cyst, eccrine duct milia or degenerated dartos muscle (BMJ Case Rep 2015;2015, Rev Urol 2011;13:95, J Cutan Pathol 1988;15:142, Br J Dermatol 2003;148:827). 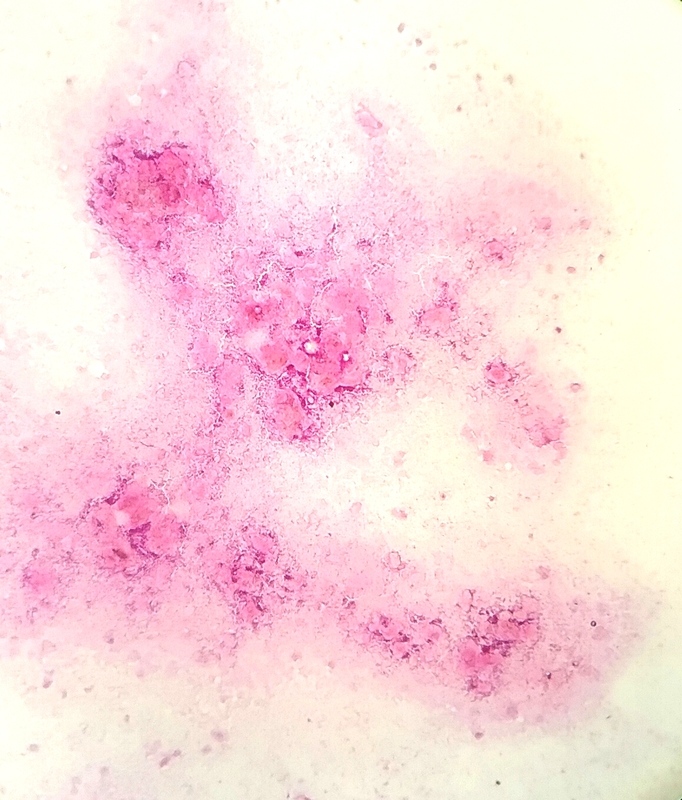 Investigators have demonstrated residual epithelium associated with calcifications in some but not all cases (Arch Dermatol 1970;102:199, Am J Dermatopathol 2007;29:172), supporting the hypothesis that they represent dystrophic calcification of epidermoid or pilar cysts (Dermatol Surg 2002;28:745, Can Urol Assoc J 2013;7:E439, BMJ Case Rep 2015;2015). Between 28% (J Am Acad Dermatol 2004;51(2 Suppl):S97) and 70% (Am J Dermatopathol 2007;29:172) of patients have an epithelial cyst associated with the scrotal calcinosis. 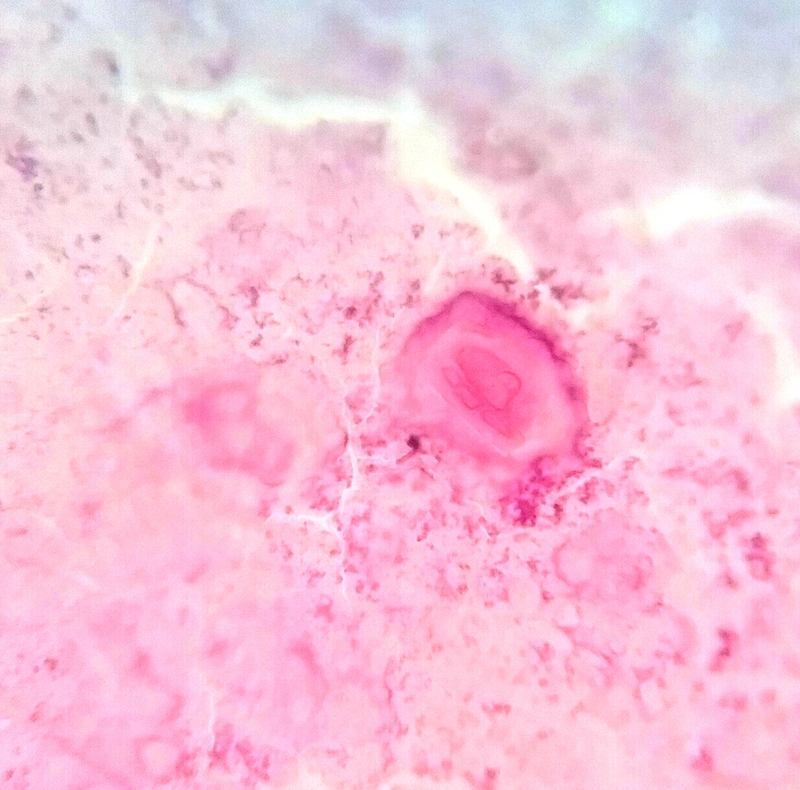 Some authors suggest that the epithelial cyst precursor may be present in most cases but destroyed in the calcifying process (Am J Dermatopathol 2007;29:172). Histologically, the dermis of the scrotum shows nodular accumulation of hard, granular, calcified, chalky material. There may be an associated granulomatous inflammatory reaction. 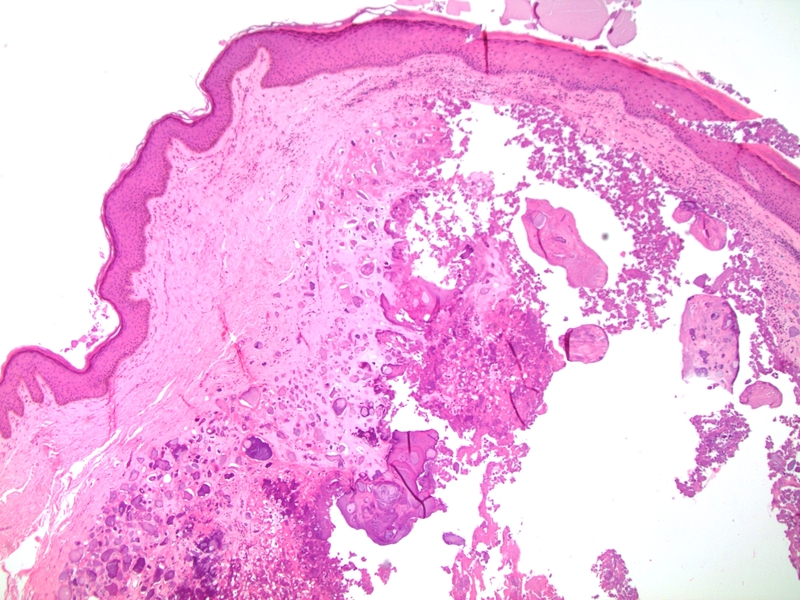 Residual epithelial structures suggesting a pre-existing epidermal or hair follicular cyst may be present. The differential diagnosis includes infection and metastatic calcification associated with underlying disease (commonly renal) in which there is a systemic increase in serum calcium or phosphate and deposition of calcium in organs. Treatment is surgical excision. This may not be necessary for asymptomatic nodules but is utilized for symptomatic, infected, recurrent or extensive lesions (Bostwick D, Cheng L: Urologic Surgical Pathology, 3rd ed., chapter 15). The lesion may recur in the residual scrotal skin (Arch Dermatol 1970;102:199). 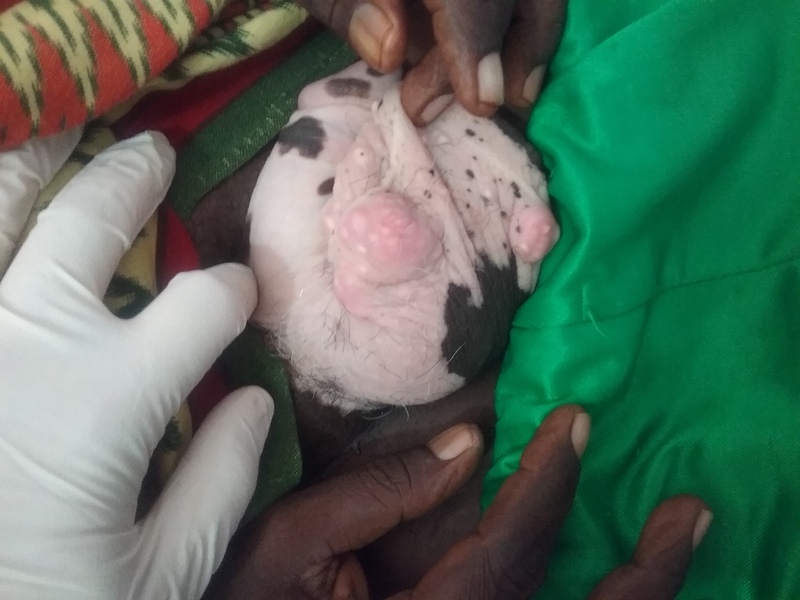 A. Scrotal calcinosis may occur in the setting of a pre-existing epidermoid or pilar cyst or by apparent calcification of dermal tissue without an identifiable cyst precursor. Approximately 70% of scrotal calcinosis cases are associated with a pre-existing epidermoid or pilar cyst. 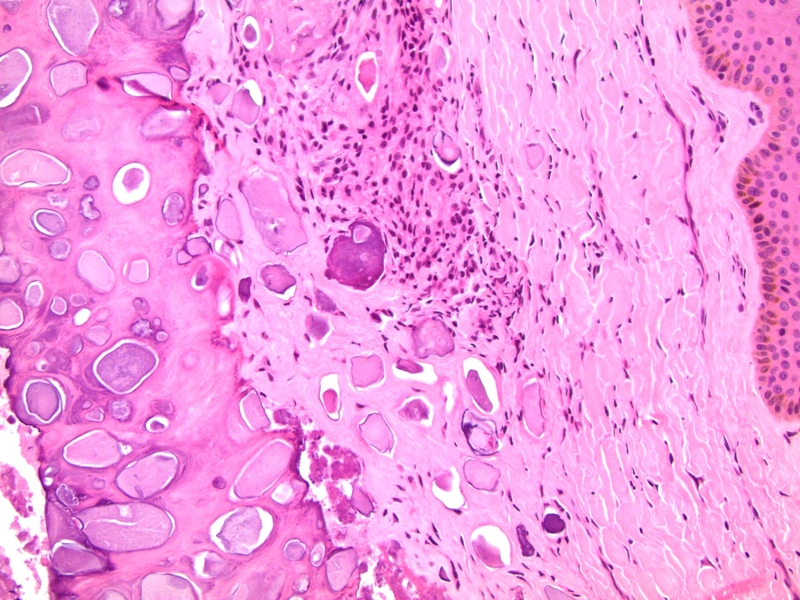 They may also occur via calcification of dermal connective tissue in the apparent absence of detectable cyst epithelium (idiopathic), possibly related to eccrine duct milia or degenerated dartos muscle.